NDSS' Aiden Laton performs a routine on the rings during the NDSS Invitational last Wednesday. This year marked the first time since 1981 that boys took part in the high school event. Photo by Adam Prudhomme. 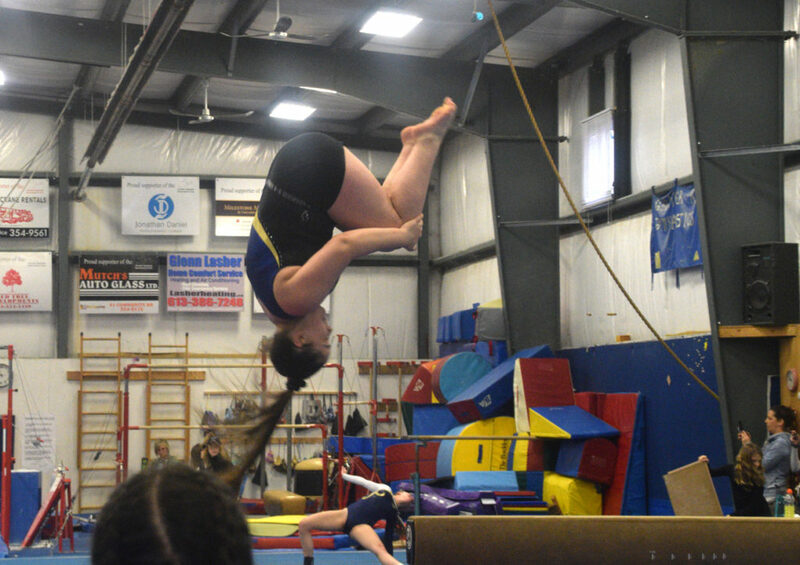 The NDSS Golden Hawks gymnastic team held their annual Invitational at the Greater Napanee Gymnastics Club last Wednesday, welcoming competitors from across the province. 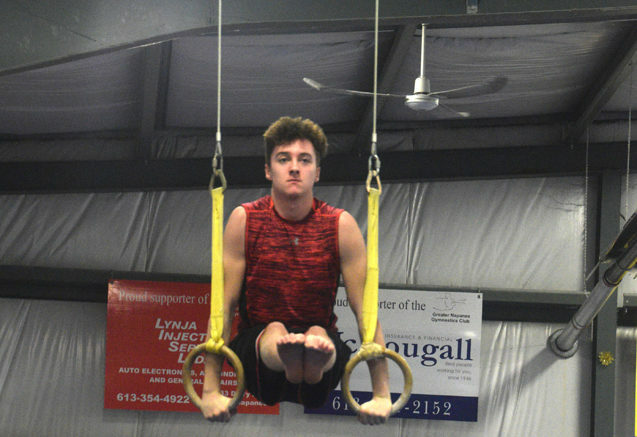 This year’s event was particularly noteworthy as it marked the first time since 1981 that male gymnasts took part, including Napanee’s Aidan Laton. Along with Laton, three other male gymnasts from Sudbury took part, each performing for the judges in an exhibition style meet. They were given critiques by the judges as well as a certificate that noted their contribution for helping to revive high school boys competition. Laton scored particularly well on the pommel, competing eight circles. In Level 1 the Hawks’ Jazmine Fish placed sixth overall, including a third place finish on the bars. In Level 5 Napanee’s Kylie Mosgrove was second overall, placing first on the beam and third on the floor and vault. NDSS’ Natalie Post completes a summersault to cap her beam routine during the NDSS Invitational. Photo by Adam Prudhomme. Teammate Natalie Post was fourth overall, earning second on vault and third on the beam and bars. In Level 6 NDSS’ Aleyah Seale was second overall, including a first on the bars and third on vault. Emma Dillion was fourth overall, finishing first on vault and third on floor and beam.